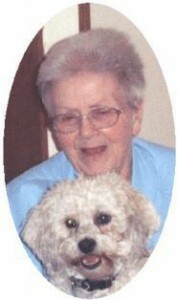 Dorothy M. Edinger, 90, formerly of Jackson, MI died December 12, 2011 at Aurora Medical Center in Grafton, Wisconsin. She was born November 6, 1921 in Jackson, MI to Claude L. and Carrie M. Burke Stuart. Raised in Jackson, she married Robert Edinger on July 1, 1955 in Angola, IN. She worked in the accounts payable/payroll office of Goodyear Tire and Rubber Co. in Jackson for over 25 years. Her husband preceded her in death October 25, 1996. In 1999 she moved to Port Washington, WI. She was active with the Loyal Order of the Moose in Michigan and enjoyed travel in her retirement. Dorothy is survived by her son Dirk (Mary) Snellenberger of Port Washington, WI and grandchildren Michelle Snellenberger, Leah Snellenberger and Alec (fiancé Jessica Rasmussen) Snellenberger. She is further survived by 9 great grandchildren, other relatives and friends. She is preceded by her husband Robert, sister Myrtle Harlan and brother DeForest “Chuck” Stuart. Memorial services with final interment will be held at Hillcrest Memorial Park in Jackson, MI in Spring, 2012.